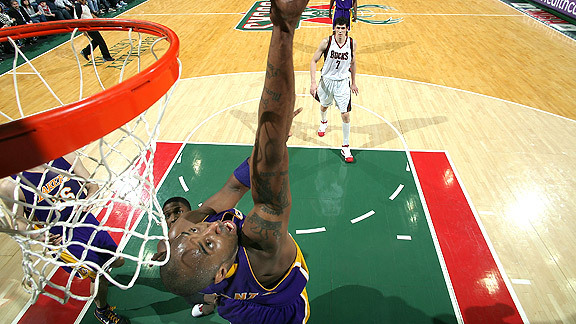 NBAE via Getty Images Kobe trumped this spectacular shot by nailing the game-winning jumper at the buzzer in OT. As we enter the most grueling stretch of the NBA season, it is time to take a look at what's been great through the first two months. The adrenaline rush generated by the freshness of a new year has faded, while the unmatched intensity of the NBA playoffs hovers on the distant horizon. With that in mind, here are 10 of the best NBA storylines to this point (in no particular order). 1. Kobe Bryant's determination to repeat. The sigh of relief Kobe felt after securing his first title as the most dominant player on the Lakers could easily have led to a complacent start. Instead, he has been as focused as ever. A spectacular first six weeks has been punctuated by game-winning buzzer-beaters against Miami and Wednesday night in overtime against Milwaukee, and a seamless integration of Ron Artest into the Lakers' fold. The 42 points Kobe scored earlier in the week against Chicago with a broken index finger on his shooting hand wasn't bad, either. 2. The resurgence of Steve Nash and the Phoenix Suns. With Shaq in Cleveland, the Suns have returned to their roots. Steve Nash has proved that his slight decline last season was more a result of trying to play with the emergency brake on (and not diminished skills). Nash is back to putting up the kind of numbers that earned him consecutive MVP awards in 2005 and 2006. Nash spreads the ball around to Amare Stoudemire and a stable of 3-point shooters, and the Suns once again have become one of the most entertaining teams in the NBA. 3. The emergence of Oklahoma City in the West. Kevin Durant, no longer a one-dimensional player looking for his next forced shot, has become an MVP candidate by learning how to make the game easier for his teammates, conscientiously defending and becoming a dominant rebounder at his position. Coach Scotty Brooks has done a fantastic job with this group in making them believe they can matter now. Along with Russell Westbrook, Jeff Green, and rookie James Harden, Durant has the Thunder poised for a run at the playoffs, and we have another relevant team in a league that has become increasingly top-heavy in recent years. 4. Brandon Jennings' coming-out party. Little was known about Jennings prior to his arrival at the Bucks' training camp. His bolting to Europe directly from high school left many questions unanswered and a lot of speculation based on spotty game films from Italy. Jennings has answered all of the questions. He is a better shooter than expected, quicker than he looked and physically tougher than his wiry frame would imply. He is averaging 20.7 points (including a 55-point outburst in November) and has left us all wanting to see more. 5. The selfless balance of the Boston Celtics. What a luxury it is for coach Doc Rivers to be able to sit back and watch a group of players epitomize what the word "team" is all about. The Celts share the ball, understand their roles, and show clear disinterest in individual acclaim. The Big Three of Kevin Garnett, Ray Allen, and Paul Pierce have been steady, while Rajon Rondo has officially become one of the top five point guards in the NBA. Kendrick Perkins is having a career year and Rasheed Wallace's versatility is a perfect fit on Boston's bench. They have been the class of the East. 6. Carmelo Anthony's unstoppable offensive display. Coming into camp in the best shape of his career has enabled Anthony to explode out of the gate with a league-leading 30.4 points per game. He embarrasses defenders with an unyielding assault of pull-up jumpers, lightning-quick first steps, power post moves and 3-point barrages. If Denver can push 60 wins and challenge L.A. in the West, Anthony will generate serious MVP buzz. 7. The rookies proving they are more than Blake Griffin and "everybody else". With the injured Griffin having yet to play for the Clippers, a number of other rookies have made huge impacts around the league. Brandon Jennings, Ty Lawson, Tyreke Evans, James Harden, DeJuan Blair, Stephen Curry and Sam Young have all made their presence felt on a nightly basis. 8. Watching the Houston Rockets defy the basketball gods. When you lose your 7-foot-6 perennial All-Star center (Yao Ming) for the season due to injury, play without your best offensive player (Tracy McGrady) for the first 23 games, and watch your best all-around player (Artest) head to L.A. looking for a ring, you are not supposed to keep your head above water. Yet that is exactly what the blue-collar Rockets have been able to do at 14-10. They defend on every play and treat every possession like the game depends on it. Give Rick Adelman a lot of credit. The guy can flat-out coach. 9. Dirk Nowitzki killing it in crunch time. It wasn't that long ago that Nowitzki's toughness and overall greatness were challenged after a collapse in the NBA Finals against Miami and a first-round loss to Golden State after securing the West's top seed. Seems like ancient history. Dirk has been sensational all season, particularly in the fourth quarter, and the Mavs have been better than expected despite the absence of Josh Howard for most of the season. Now we just have to see if they can sustain it in the West. 10. LeBron. No explanation necessary. ESPN analyst Tim Legler is a regular contributor to the Daily Dime. Tracy McGrady likely will end up getting traded at some time in the next seven months -- maybe in a sign-and-trade deal after he becomes a free agent July 1, maybe at the trade deadline in mid-February, or maybe even sooner. But what is killing the Knicks' chances of landing McGrady, who would be a panacea for them next summer when they plan to be major players on the free-agent market, is their insistence that Jared Jeffries be included in any deal with the Rockets. It has been well-chronicled how Jeffries and teammate Eddy Curry are standing in the way of the Knicks' master plan of plans, with their cap-clogging contracts (Jeffries is due to make $6.9 million, and Curry is on the books for $11.3 million) hindering New York's ability to go after (or come close to going after) two max-level free agents next summer. But if the Knicks were able to move one of them (and trading Curry is a virtual impossibility) and take back an expiring contract in return, it would allow the Knicks to either go after a second max free agent in a sign-and-trade deal (in which David Lee and Nate Robinson would be the bait), or have enough cap space left over after signing a max free agent to retain Lee. As things stand now, the Knicks will have to either engineer a sign-and-trade centered around Lee, Robinson and/or Al Harrington, or renounce their rights to Lee, Robinson, Harrington and Larry Hughes, in order to clear their salary-cap holds (the dollar amounts at which they are held against the Knicks' cap) and free enough cap space to sign LeBron James, Chris Bosh, Dwyane Wade or another max-level free agent. ESPN.com writers and TrueHoop Network bloggers chatted with fans and gave their in-game opinions throughout Wednesday night's slate of games -- all in Daily Dime Live. Kobe Bryant, Lakers: He scored 27 of his 39 points after halftime, including the winning jumper as time expired, to lift the Lakers to an OT win against the Bucks. Kevin Durant, Thunder: Rocking creamsicle orange Nike sneakers, Durant matched his worst scoring game of the season, finishing with just 12 points on 4-of-18 shooting against the Mavericks. "This one's on me. I let us down tonight. I feel bad, that's a game we should have won. We didn't make shots at the time we needed to make shots." 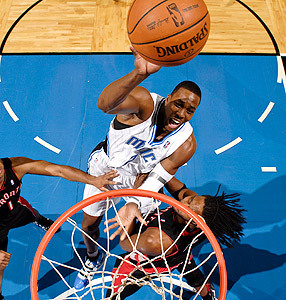 Dwight Howard, the reigning Defensive Player of the Year, scored 18 points, grabbed 14 rebounds and rejected eight shots to power the Orlando Magic past the Toronto Raptors. On paper, this looks pretty good, I'll admit that much. On paper, the punchy Milwaukee Bucks hung with the mighty L.A. Lakers. Remember Rocky? He didn't beat Apollo Creed either, but that didn't leave us feeling any worse, did it? Kobe Bryant played the role of Creed, but the Bucks lost this one by knockout, not decision. And like the Bucks, I'm sure Rocky felt a lot worse about the loss than he let on, because this one doesn't feel as good as it looks. Fighting through a number of calls that the Milwaukee crowd would deem questionable at best, the Bucks had a six-point overtime lead with 1:24 left. Bryant's three-point play and fall-away jumper at the buzzer helped undo that, though. It's hard to feel good when one of the league's best pulls the rug out from underneath you. Alas, there is plenty good here. Bucks guard Michael Redd put together his finest game of the season, dropping 25 points and even finding center Andrew Bogut and forward Ersan Ilyasova for baskets in overtime. Whether Redd could mesh with the new-look Bucks has often been a topic of debate for fans this season, and there were signs against the Lakers that this could work out. The knock on the Bucks this season is that they haven't been able to muster enough offense to keep up with their defense. The Bucks have had to ride rookie guard Brandon Jennings for numerous games, but he was watching this one from the bench in crunch time. Oddly enough, that was a positive sign. There have been precious few moments when the Bucks have thrived, or even survived, without Jennings shouldering the load this season. So maybe the sense of disappointment Milwaukee fans felt immediately after this one is only fleeting. There is always another game in the NBA, another chance to win. Hey, even Rocky wins in the second movie. To read more, check out Schmidt's TrueHoop Network blog, Bucksketball. "I think it starts with Dirk and Jet," the 16-year veteran point guard said, referring to Dirk Nowitzki and Jason Terry. Omri Casspi, the first NBA player from Israel, scored 22 points in his first start in Sacramento's 112-109 home win over Washington. That ties the most points scored by any Kings player in his first NBA start since the team moved to California in 1985. Randy Brown scored 22 against the Clippers in 1992.